A gorgeous detached cottage set in a stunning location high above the rooftops and historic buildings of Wirksworth. 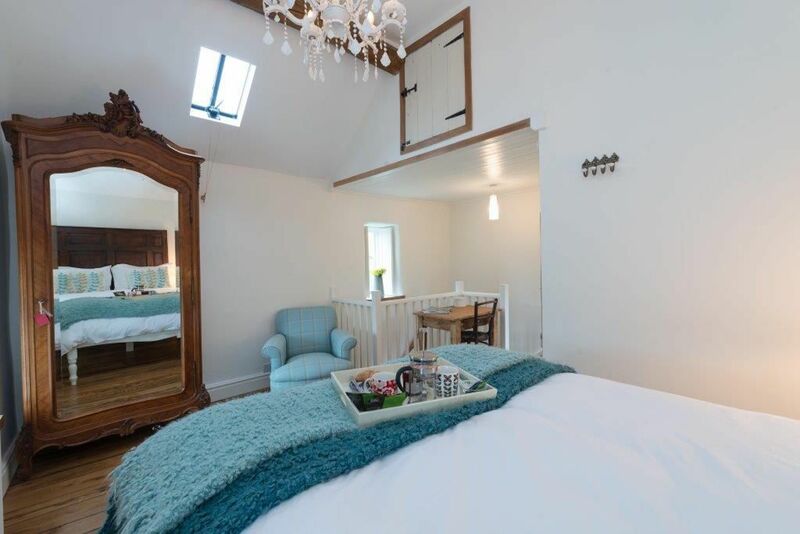 The cottage has been lovingly restored to the very highest standards. The area around the Wee House has the feel of a Cornish fishing village – a random patchwork of houses and gardens removed from traffic and noise. The Wee House is peaceful, quiet and has an ‘away from it all’ feel – yet it is only a short amble down the hill to the quirky boutique shops and independent eateries below. Great for a relaxing break away or an ideal place to set off on adventures in the surrounding Peaks – you can walk and cycle from the door. -Changeover days are Fridays AND Mondays. In low season we will start on other days where possible. We welcome 2 night stays in low season - please enquire for a price. Original features abound – twisty oak beams, a gritstone hearth and deep recessed windows. These are complimented by solid oak floorboards, a fantastic wood burning stove and handmade wooden shutters. Fabulous finishing and touches throughout. Hello - we are Sarah and Mal and we live down the hill and round the corner from the Wee House on the Hill. We were regular visitors to the Peak District and moved to Wirksworth in 1998 because it gave us all we wanted - beautiful walking and cycling country and an open and friendly community - it is a vibrant town with local shops and a thriving creative community full of designers, artists, musicians and sculptors. Wirksworth has a quaint village feel but with the benefits of all the amenities of a small town (restaurants, cafes, pubs etc). We lived in the Wee House as a rental property when we first moved to Wirksworth and fell in love with the cottage. When it came up for sale we saw it as an opportunity to lovingly improve it, and turn it into one of the best and most enjoyed holiday cottages in Derbyshire. The 'Wee House' is stylish, comfortable and extremely well appointed with stunning views from both the cottage and garden. It is a 'top spot' literally and also because of its proximity to Peak District attractions. This quaint miners cottage has many original features, oak beams, and floorboards, gritstone fireplace with log burner. The cottage is a mix of traditional and contemporary. Downstairs offers comfort and warmth whilst upstairs offers a french boutique feel which is light, spacious and peaceful. The area surrounding the 'wee house' dates back to the 17th century and is called the 'puzzle gardens' due to the random layout of cottages and pathways which gives it a similar feel to a cornish fishing village. A top-notch and immaculate space. Limestone tiling on the floor and walls, with under floor heating and quality fittings. Gas powered combination boiler. Thermostat powered - so easy to turn up and down. Morso Squirrel woodburner - with an initial set of logs and kindling to get you going! Curl up on the comfy sofa or relax on the leather captain’s chair as you watch a film on the flat screen (DVD & Freeview. Also has iPod / DAB radio / CD player. Complete the luxury in front of the wood burner (complimentary basket of logs is provided). Cute and well appointed – everything you need to create fabulous meals away from home. Quality utensils and cookware and sharp knives and even cook books to inspire! A small collection of books beside the gritstone fireplace. A small collection of DVDs to relax to. Notes on accommodation: This stylish hideaway is literally only 1½ mins away from fantastic independent cafes and artisan shops. All you need is on your doorstep - second hand book stores, tantalising cafes, antique shops and great restaurants. The stunning vistas make the setting of the Wee House an ideal escape from everyday life. The maze of pathways around this historic area, developed in the era before cars, mean there is no parking beside the cottage – but this makes it wonderfully quiet! A short 1 minute walk takes you to your car. There is easy access to the Peak - explore straight from your door. Why not hire bikes and cycle one of the fabulous local trails - Monsal Dale, Tissington or the High Peak Trail. Soak up Chatsworth Estate, Haddon Hall and many more. Why not enjoy a night at the independent Northern Lights cinema (3 minutes away – we’ve timed it) with pre film tapas and wine – cosy up on the funky sofas and relax! Outside: Two sunny patios allow you to soak up the ‘stand and stare’ views across the town and down the valley. There is a steeply sloping garden with love seats in the wall. A cute little barbie is available for those alfresco moments as you chill out and soak up the vistas. You can lock your bikes safely is the secure storage outside the front door. It’s also handy for drying wet kit, or storing muddy boots. Cleaning / Towels / Linen / Maid service: The Wee House is spotlessly clean and is maintained to the highest standards. Guests love the fresh and crisp ironed cotton sheets and fluffy towels. The pillows and duvets are feather, synthetic are available on request. Other: The thermostatically controlled gas central heating allows you complete control of your ideal temperature in the house – it also provides hot water on demand. Fabulous little cottage in a great location.. Steep walk up from The Dale - I need to get fitter! Fantastic views, especially when the rain is seen across the valley in blown drifts! Comfortable seating & very comfortable bed. Didn't use the kitchen much (we were on holiday) but good quality utensils etc. This was our second stay at the Wee House. We last stayed 4 years ago but hopefully willl come back again sooner. The house is beautifully appointed and ideal for 2 people. Lovely views from the windows and very cosy inside with the wood burner. Wirksworth is a nice little town from which to explore the Peak District. Although the weather was somewhat challenging while we were there, we managed a couple of cycle rides on the Tissington and Monsal Trails and also a couple of walks. Found some great pubs where we could shelter from the elements, particularly the Feather Star in Wirksworth and Twenty Ten in Matlock. We would happily return to the Wee House and would love to come if we could arrange for warm sunshine so that we could sit outside and enjoy the views! However the house can be enjoyed at any time of year whatever the weather. The welcome pack of prosecco and chocolate biscuits was much appreciated. In an attempt to be authentic we feel the furniture in the lounge was poor, the settee and the dining chairs were poor. Many thanks for your feedback. We are very sorry you were disappointed by the quality of the furniture downstairs. We pride ourselves on providing a 'perfect' hideaway for our guests and are therefore disappointed we have not lived up to your expectation. We will check the sofa and if not ‘top notch’ we will will sort it. The table is a restored 1950's gate-leg oak table and the Bentwood chairs were chosen to match and fit the space. For future guests, it is worth noting the photo of the living area downstairs was taken last year and is an accurate reflection of the space and furnishings. Keeping the Wee House in 'tip top' condition is incredibly important to us. East Midlands airport 45 minutes / 25 miles. Birmingham airport 1 hour 15 minutes / 50 miles. Manchester airport 1 hour 30 minutes / 60 miles. Car hire is available at all airports listed. Wirksworth is a small historic market town with the feel of a village. It has all the amenities you would want for a holiday in the peak district. The town is located at the top of the Ecclesbourne Valley surrounded by stunning scenery with a myriad of tourist attractions. The Chatsworth Estate is a 20 minute drive away, with Bakewell being 25 minutes, Ashbourne 20 minutes and Buxton 25 minutes. Matlock bath (3 miles), Cromford and Arkwright mills (2 miles), Carsington Reservoir for water sports, trails and shops (4 miles), High Peak Trail (1 mile). Keen cyclists have access to a huge range of cycling routes (owners have details) - both on and off road. There is a climbing wall at the local leisure centre, with extensive gritstone climbing at the local 'edges' - Stannage and Froggatt. The area is criss-crossed with footpaths and bridleways allowing easy access for walkers and cyclists from the doorstep of the 'wee house' to stunning countryside. There are 3 convenience shops, 2 butchers and 2 bakeries, along with a pharmacy, dentist and health centre. There are 2 banks and 2 ATMs. Each Tuesday is market day and on the first Saturday of each month there is an organic and traditional farmers market. There are 4 pubs in town (1 with sky sports, 1 with a pool table, 1 serves lunches, 2 with outdoor seating areas). There is a selection of cafes and restaurants; the local takeaways include a Chinese, an Indian and a Fish & Chip shop. Also try the fnatastic Northern Lights cinema in town - open a year and brilliant! Changeover Day: Friday and Monday changeover is preferred with departure by 10.00am and arrival from 3.30pm (to allow for cleaning, linen change etc). However please ask as there may be some flexibility depending on other bookings. If availability allows we will consider stays of 2 nights.